Background: Pericyclic reactions characterized by a cyclic transition state, have been established as a dominant approach for the synthesis of heterocyclic scaffolds owing to their tremendous efficacy, regioselectivity, and enantioselectivity. 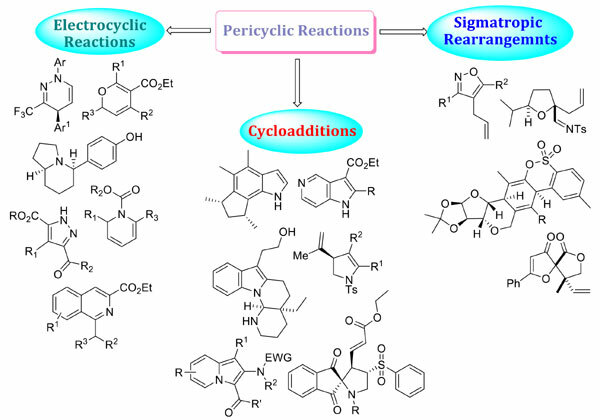 Pericyclic chemistry is a promising and creative route to various biologically significant five and six membered oxygen or nitrogen ring systems. Recognizing the reaction's potential, synthetic organic chemists have invested significant efforts in developing and applying a seemingly endless array of useful variations of pericyclic reactions. Objective: The driving force of this review is to focus the character of perfection and beauty inherent in these powerful reaction pathways that lead to unique and densely functionalized heterocylic assemblies. Conclusion: In this review, we have presented recent strategic applications of pericyclic reactions that provide quick access to molecular complexity with high efficiency. A summary of these illustrative examples will showcase the extensive role of pericyclic chemistry in the construction of synthetically intimidating structural motifs. Pericyclic reactions, asymmetric synthesis, cycloadditions, sigmatropic rearrangements, electrocyclic reactions, oxa and aza heterocyles.